Iraqi security forces are close to recapturing western Mosul from the Islamic State of Iraq and Syria, the Operation Inherent Resolve ground forces commander said today. The Iraqi forces, with coalition support, are making significant progress every day in the increasingly tough fight for Iraq's second-largest city, Army Maj. Gen. Joseph M. Martin told Pentagon reporters via video conference from Baghdad. 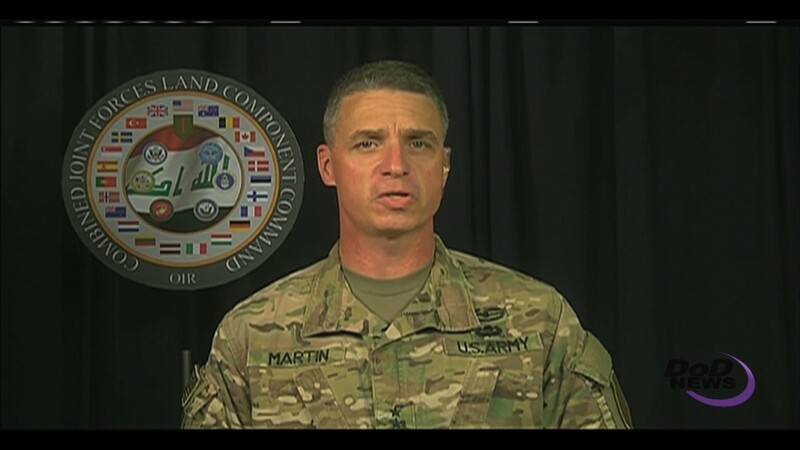 Martin, the commanding general of Combined Joint Forces Land Component Command Operation Inherent Resolve, highlighted the Iraqi forces' strength and resolve. "They continue to improve their capability and demonstrate a level of professionalism that makes me proud to serve with them," he said. "It's only a matter of time before they liberate the rest of Mosul and defeat ISIS in Iraq." ISIS's capability and cohesion as an organization are weakening, and the terrorists are under pressure throughout Iraq, Martin said. "ISIS is reeling from defeat after defeat across the country," he added. "Their leadership has fled, and their days are numbered." The Iraqi forces and their coalition partners are committed to the fight, Martin stressed. "We understand that a safer Iraq, a more stable Iraq, means a more stable region, and a more stable region means we're safer back home," Martin said. The terrorists have indiscriminately attacked innocent civilians, and are using increasingly inhumane measures to terrorize, injure and kill residents, the general said. Those brutal tactics include hostage-taking and using improvised explosive devices, mortars and rockets against the population, Martin explained. ISIS has targeted residents trying to escape the violence, killing hundreds of civilians are killed each week, with evidence showing that number is increasing, Martin said. "The coalition will not abandon our commitment to the Iraqi partners because of ISIS's inhumane tactics of exploiting the population and destroying as much of Mosul as possible," he said. The longer the fight continues in western Mosul, the more the civilians will suffer at the hands of a brutal enemy, Martin said, adding, "This is why ISIS must be defeated quickly." The enemy is surrounded, Martin pointed out. Foreign fighters, unable to blend into the population, have nowhere to go and can either surrender or die, he said. "What's left is a tough fight through some very complicated terrain that will require a significant amount of tenacity and commitment," Martin said. "But I assure you, the Iraqi security forces are up to that task -- and I also assure you that we'll be there to advise, assist and enable them as they do it." In previously liberated eastern Mosul, residents are resuming their lives, Martin told reporters, with essential services being established, the government working to improve the quality of life, and more than 250,000 children returning to more than 320 reopened schools. "Through coordinated efforts with the government of Iraq, the U.N. and along with humanitarian partners, Mosul's residents are on track to a sense of normalcy that existed prior to the brutal rule of ISIS in the city," he said.